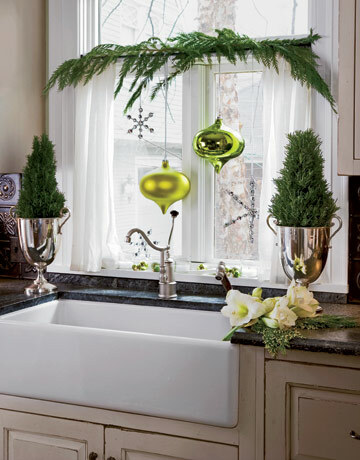 The kitchen is small, so the window is my focal point for Christmas decorating. pine cones drapes across the window and down the sides. A christmas candle painted grey burns at the window. Are you a candle person at christmas time? I am! to get in the holiday spirit. A bit of green garland for the mini hutch. and flocking which makes it so pretty. in silver containers have silver mesh ribbon bows. Its so dark in this kitchen so the pictures are never the best. It does look very pretty, you have to take my word! what room do you start in? and has been in my online shop. It didn't sell so I decided to give it a makeover. but I am thinking the grey finish with champagne accents might be more appealing. Grey is THE neutral color of the decade. This chandy has a lot of detail with rosette swags and fluted lines. It is an elegant little chandy, and came out of an estate in Old Naples, Florida. 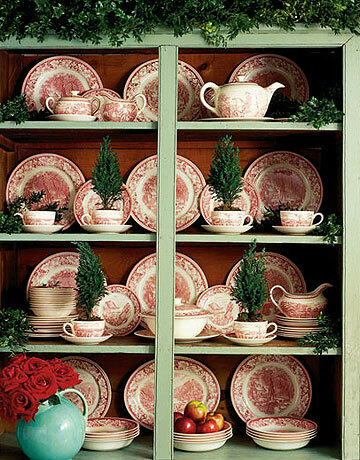 On the petite side, so it would be perfect in a powder room or small guest room. To elegant grey~you can find it for sale by clicking here. but this year I might like to do something more simple like metallics. on Ebay still in the original box. and you can find them for sale online. 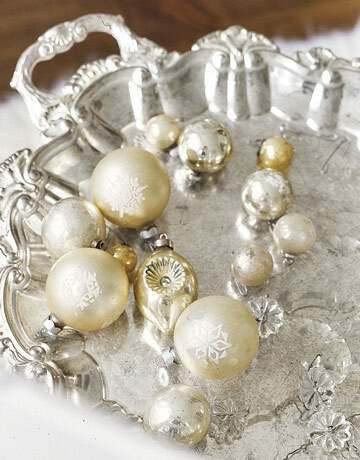 A simple but festive decorating idea is to take a silver tray and put some ornaments on it. 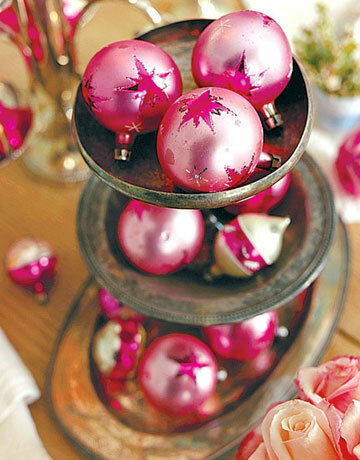 with pink balls for a monochromatic xmas decor. 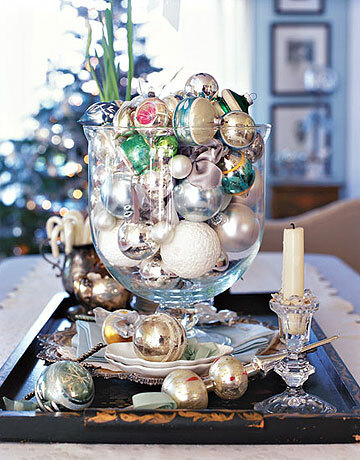 to the gills with ornaments making another easy holiday centerpiece. 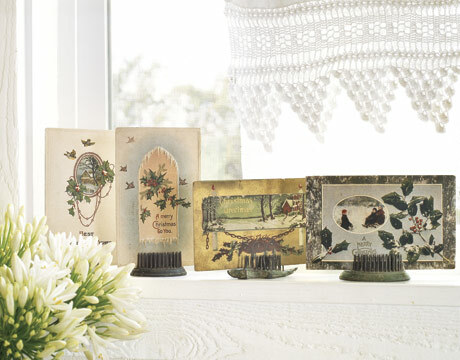 to display christmas cards for the country gardener. 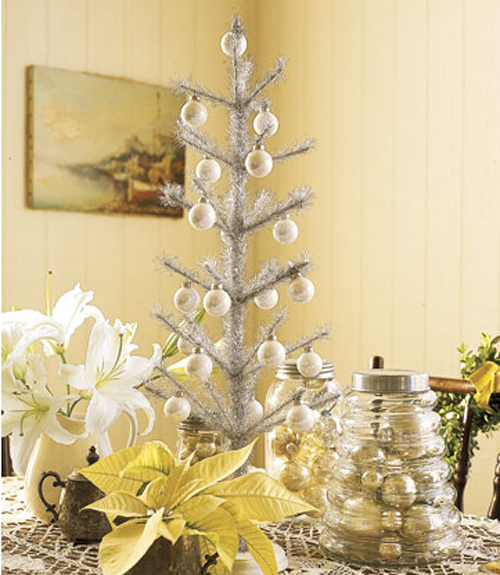 on Christmas decorating~just add greenery! which I just started on yesterday. 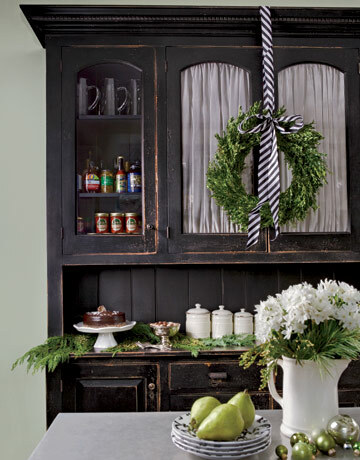 and a wreath really brings Christmas cheer into the kitchen. and these images from Country Living were just the thing! Our city throws a Holiday Parade every Saturday after Thanksgiving. It helps to jump start the mood of the season, and this year I was looking for some of that. It is kind of a hokey parade that is silly and sweet and just about anyone can get in this parade. Parents, elderly, kids and dogs pile out of their duplexes and apartment buildings that line the main drag and grab a spot by the sidewalk to watch the parade. Mr. Maison Decor always works the parade and this year I wanted to capture a bit of it for the blog. A beautiful day around 60 degrees~hubs took this picture of me and that unassuming church behind me is where we tied the knot. Mr. Maison Decor and his family has gone to that little church forever. Two little cuties all excited to get their sidewalk spot to watch the parade. Most parades have legions of police and firemen and I always feel our nation's pride when I watch them march by in formation. The Official Boston Red Sox Trolley car made an appearance and kids were eager to grab the candy thrown from the trolley. Clowns are kind of scary to me~and I think lots of kids get nervous around clowns. Santa on a low rider bike, too warm for his Holiday sleigh! There was a lot more to this parade but that is the gist of it, lots of marching bands, the Boy Scouts, the Salvation Army, the newly elected officials all joined in to spread holiday cheer. Back at the ranch, I have some projects waiting on me. This is the light fixture that I got for the kitchen island. Hopefully it will be up before Christmas! It is pretty neat looking, and I just had to share it~you can find it on Overstock.com. A copper wire cage with crystals suspended inside~ a little bit of industrial bling I guess you could call it. My really big project ahead is redecorating this office. I am selling the draperies and the carpet in my Etsy shop. Lots of the furniture is about to be painted, as is the entire office. Since I opened an Etsy shop I need a place to store all the items I am selling. I picked up a pine book case and a bonnet top upper half of a secretary desk at auction. I will be coming up with a plan on incorporating these pieces into the work room. This room is a complete hodge podge right now and it is driving me insane when I look at it! Keeping it real~this will be a wonderful transformation if my vision guides me correctly. This pine piece will get painted and I plan to skirt this drafting table that it sits upon. That is what I am thinking at this point. I have a color palette in mind and am excited to start executing the plan. My gilded Louis VXI chair sits completely naked! I'll be finishing this clients home before Christmas too. We are still busy trying to accessorize it and find carpets and ready made draperies for the spaces. And of course there will be lots of holiday decorating around the house too! This is my tree from last year~ I so need to get going on pulling out my decorations, but I had to get this mish mash of events and plans out of the way so I can back to design blogging, christmas decorating and sharing completed projects with lots of eye candy. Thanks for reading~and full steam ahead! Thanksgiving is the holiday built around family gatherings. The older we get it seems the more complicated our lives become with all of those that you love often in different places. This post might be more interesting for any of my family that reads this blog, but you are all welcome to walk down this memory lane with me. This old Polaroid shows the McCauley boys and my nana and grampa with my sister Ellen at the end of the table lining up to get a plate of food. We always did buffet style as there were so many of us, with lots of jostling for the front of the line. Of course there was always the "kids table", which was a bridge table or two set up for the youngest cousins. I was the oldest sister, so I never had to sit at the kids table, thank goodness! My parents house had a big dining room with paneled walls and leaded glass windows and even a buzzer on the floor that you could ring to call in the butler (if only we had a butler)~it was the kind of house that made it perfect for these kind of big family dinners so we hosted many. I am in green next to my Nana and Grampa here, circa 1980. Here is Uncle Will, with mom and nana and grampa at this Thanksgiving in 1977. Will died just this month and I will always remember him performing his rendition of Minnie the Moocher by Cab Calloway. Oh what fun that was, to listen to Uncle Will sing and get us all to sing along. Mom played the piano and Will belted out the tune! Here I am with my sisters Susan and Ellen in the early '80s~I have spent almost all of my 51 thanksgivings with them. Nana was famous for her apple pie in addition to her fondness for Manhattans. My sisters flank our McCauley cousins in this shot from the 70's. Now we don't get to have Thanksgiving with the McCauleys very often any more, so we try and catch up on other occasions maybe once or twice a year if we are lucky, often meeting them on Marthas Vineyard where we still spend summer vacations and crossing paths. My cousin Chris McCauley joined us when Susan and her twins visited this October. My little brother Brian is the closest in age to me. I don't get to see the twins or my youngest sister as she is living in Kansas City now. Here I am trying to bribe one of the twins with Ritz-bits. She was not a happy camper meeting us strangers, but I will say the other twin, my god-daughter, was very happy to hang out with Auntie Amy. This thanksgiving my mom and dad and two brothers all traveled to KC to spend the holiday with Sue and Tim and the girls. We talked on the phone after dinner and shared a few laughs. Back at our house, it was my sister Ellen and her husband Mike who joined us. A far cry from the big gang of all the siblings and cousins from days gone by. My hubs and her hubs stuffed their faces had some hors' douevres while I toiled whipped up the dinner. That is my youngest, Colin, in the mirror home from college. Son Brandon is watching me make the gravy, the bird is out of the oven waiting to be carved while the ex hubs and sister Ellen are looking down at Brandon's feisty chihuahua Kingsley. Do your kids have dogs that come to dinner or for sleepovers? Mine do! So we had three dogs, one husband, two sons, one girl-friend of son, one step-son, one sister, one ex-husband and one brother-in-law around the table. The modern family? Too bad Ellen's purse was in the way~but this was one day blogging and photo styling took a back seat. So there are no pretty pics, but it was ok as the food got high marks! Colin tries to get the camera on the tripod going, as hubs carves up the turkey while I am still stuck at the stove. We woke up to no hot water, of all days (!) so I had a fast cold and unpleasant shower before the guests arrived. No hot water was a big inconvenience on this busy day in the kitchen. However my big vintage sink worked out fantastic and I was happy with how functional it was. So lets toast to the old days~and the fond memories. Lets not toast to the over processed hair! 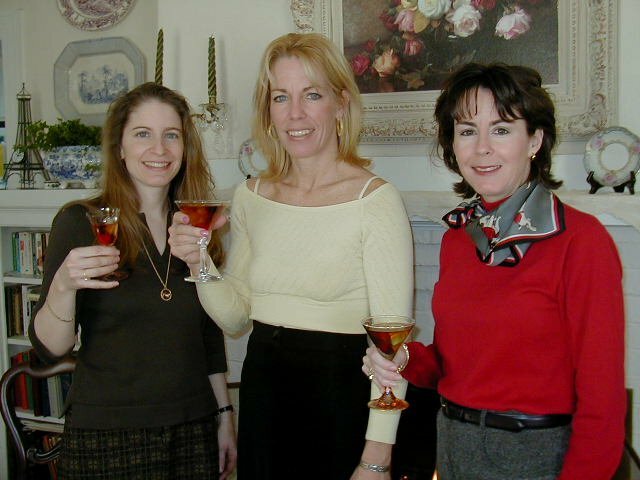 This photo of me and my sisters on Thanksgiving Day was taken by Dad, who mixed the batch, back in 1999. To those that aren't here any longer, and those that we don't get to see. There were no Manhattans this year at our house, replaced instead with white wine. Manhattans make the cooks job harder I have found, as they pack a punch, so I vetoed the tradition. Sorry Nana! Although I can report that the tradition was upheld in Kansas City. I'll be content with the moments I get to spend with my sisters and my cousins and my growing family wherever I find them like this past October with cousins and sisters and nieces. The last few years I haven't had all of my sons around the table as life finds them splitting off with their girl friends and spending their Thanksgiving in the homes of other families. It is not so great honestly...so this post finds me remembering the good old days, growing up in a great big family~with fantastic Thanksgivings. Thanks mom and dad. You did a good job giving us a childhood filled with fun times and that translates into great memories~pretty darn priceless.